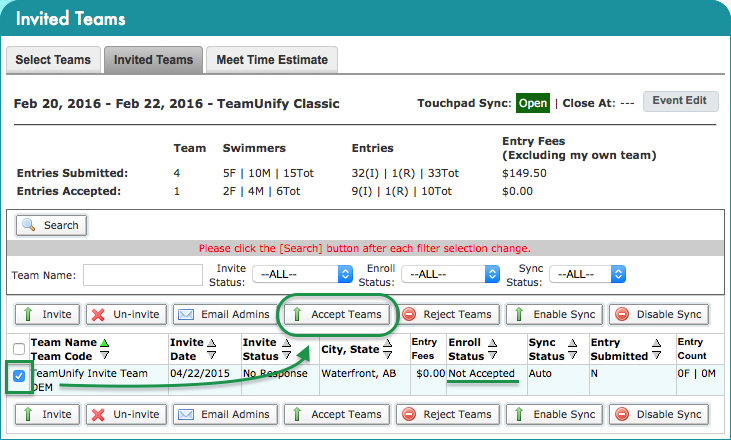 In order for visiting team's entries to sync to TouchPad, you must accept their entries in SwimOffice. Then when you sync in TouchPad they will show up. Click Invited Teams under desired event. To update, place a check mark to the left of all teams that need to be accepted and click the Accept Teams button. Click File > Sync Now to SwimOffice, or press Ctrl+Y. Confirm the entries have synced.